Season Two is generally considered to be the worst of all the TNG seasons, and with good reason: there were some truly atrocious episodes. Of course, the Borg were introduced in Season Two, so it can’t be totally discounted. Yesterday, we looked at the exterior, engine room, and bridge of the new Enterprise. But the bridge wasn’t the only part of the ship where we spent a lot of time, even just on Deck One. Two other rooms were extremely important — although neither was the bathroom*. I find it hard to even remember how I felt, 25 years ago, sitting in the living room with my parents and waiting for Star Trek: The Next Generation to premiere. I’d seen some clips from the first episode courtesy of our VHS copy of The Voyage Home, but that was all I knew. Space: the final frontier. These are the voyages of the starship Enterprise. Her continuing mission: to explore strange, new worlds; to seek out new life and new civilizations; to boldly go where no one has gone before. Stretch. Snap. Zoom. Flash. And an era began. In 2007, I wrote a book. In 2010, I finished editing it*. Either this year or next, it’s going to be published**. This is not a post about book contracts. It’s a post about technology. About a year and a half ago, I wrote a post about how fast data storage technology is expanding. My example was my USB drive, which holds eight hundred times as much data in something the size of my finger than my very first hard drive, which was about the size of half a frozen dinner. This morning, I was catching up on my news feeds and I found another technological change that struck me. You may already know that BlackBerry — once the bastion of corporate offices and enterprise e-mail systems everywhere — has recently been on the ropes. Their tablet wasn’t perfect when it came out, and you have to be perfect to compete with the iPad. Their first touch-screen phone wasn’t so great either. They don’t have an app store with even close to the number of offerings that Android and Apple do. And — let’s be honest here — BlackBerry devices just aren’t cool. This is very close to the BlackBerry I used to have, except mine had more soft-keys. That’s now. In 2012. But in 2006, I got my first (and only) BlackBerry, and it was awesome. 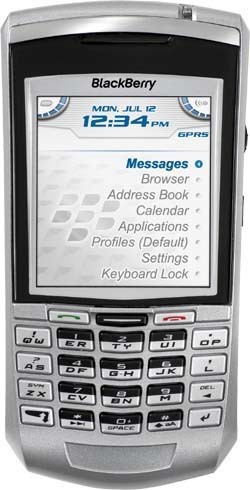 It was the precursor to the Pearl, the first one with a narrow keyboard, and I thought it was the best phone I’d ever have. I could text, e-mail, surf the web (in a limited fashion), read stories online, play games, use personalized ringtones and message sounds, and, well, if I wasn’t able to take pictures, that wasn’t a big deal, because I had a camera already, right? In early 2007, I started writing a novel (as I mentioned a few paragraphs ago). Because my main character was kind of a tech-geek, I made sure she carried a BlackBerry and knew how to use it. I don’t know which one it was, but I’m sure it was a good one. It may even have been the one I had. The point is, by the time I finished the book in the summer of 2007, BlackBerry was still the standard by which I judged phones. Anyone who was anyone had a BlackBerry. Of course, the iPhone happened shortly after that, and that was most definitely a game-changer. Between the end of the writing period for the book and the time it’ll be released to the public, I’ll have gone through five cellphones. Five cellphones in five years. The HTC Tilt/TyTn II, a monster phone that I would’ve kept if it hadn’t started crashing on me all the time. A short-lived Samsung BlackJack — a capable enough device, intended to be a BlackBerry replacement, it was given to me at my old job. I didn’t think I needed it, since I already had an iPhone, but they wouldn’t pay for it so I had to carry two phones. My HTC Evo, which I wrote about a year or so ago. I’m writing another book right now, and my main character has a touchscreen device — either an iPhone or an Android; I’m not sure which. The point is, I’m being a little more vague because (a) I don’t know when I’m going to finish writing this book and (b) I don’t know when it’s going to be sold once I do. I like to be as accurate as possible when I write, which is why Sarah (in the 2007 book) had a BlackBerry, and which is also why Andrea (in the current book) rides very specific bus routes to get around town. I believe little details make a story better — not too many of them, but enough to let the reader know that the author really put some thought into every aspect of the story. Get the small details right, and people in general will believe you if you fudge the big ones***. But I’m still amazed that, only five years after finishing the book, the device that I gave my main character because it was so freaking cool is now so out-of-date that literally only one person on my entire floor here at work actually has one. Technology is moving faster than ever. We writers have to keep up with it. * I know, I know. It took me way too long. ** The contract is in my e-mail box. I’m reviewing it with my attorney, just to make sure it’s 100 percent aboveboard. *** Story of my life.